Consumers have the right to know if their food has been genetically modified. However, the U.S. government does not require labeling of genetically modified organisms (GMOs) or ingredients so that shoppers can make informed decisions. More than 60 other nations, including France, Germany, Japan, Australia, Russia, China and the United Kingdom, require labeling of GMOs (Center for Food Safety, 2013a). Few safety studies: The federal government requires strict safety evaluations before new drugs go on the market but does not mandate similar safety studies for genetically modified crops. The government does not require that genetically modified food be tested for carcinogenicity, for harm to fetuses or for risks over the long term to animals or humans. Few such studies have been conducted by independent scientific institutions. Superweeds and more toxic pesticides: Genetically modified, herbicide-tolerant crops have spurred so-called “superweeds,” pest plants that have mutated to survive herbicides. More than 61million acres of American farmland are infested with Roundup-resistant weeds (Farm Industry News 2013). A 2012 survey conducted by the marketing research group Stratus Agri Marketing found that nearly half of American farmers reported finding superweeds in their fields (Stratus Agri Marketing 2013). To control these hardy plants, many farmers have resorted to older, more toxic herbicides like dicamba, and 2,4-D. Both dicamba and 2,4-D are known to cause reproductive problems and birth defects and pose increased risks of cancer. Increased pesticide use: Herbicide resistance has led to more, not less, herbicide use. According to estimates published in 2012 by Charles M. Benbrook, research professor at the Center for Sustaining Agriculture and Natural Resources at Washington State University, herbicide-tolerant crops that stimulated superweed growth caused farmers to use 527 million pounds more herbicide between 1996 and 2011 than would have been the case if those farmers had planted only non-genetically modified crops (Benbrook 2012). Cross-contamination: According to the International Service for the Acquisition of Agri-biotech Applications (ISAAA), a non-profit group that records the global status of biotech crops, almost 70 million hectares of genetically modified crops were planted in the U.S. in 2012 (ISAAA 2012), up from 64 million hectares in 2009 (ISAAA 2009). As GMOs proliferate, many organic farmers must struggle to prevent cross-contamination of their crops by genetically modified seed or pollen spread by wind, insects, floods and machinery. Unintended genetically modified contamination has become a major issue for organic growers hoping to sell their crops in places that strictly regulate or ban genetically modified foods. According to an estimate by the Union of Concern Scientists, potential lost income for farmers growing organic corn may total $90 million annually (Union of Concerned Scientists 2001). The agricultural chemical industry developed genetically modified crops and introduced them to the market with the promise of significantly higher crop yields. While crop yields may in fact be on the rise, the contribution of GMO technology is a matter of considerable debate. Some groups attribute the increase in yields to improvements in conventional agriculture (Union of Concerned Scientists 2009). Any benefits provided by GMO technology have been overshadowed by increased use of toxic pesticides and proliferation of herbicide-resistant weeds. Until Congress or state governments enact mandatory labeling of genetically modified ingredients in food, American shoppers are left in the dark. So if they want to avoid food with genetically modified ingredients, what are they to do? Option 1: Buy organic. National and state organic certification rules do not allow GMOs to be labeled “organic.” When you buy organic, you buy food free not only of synthetic pesticides but also genetically modified ingredients. Option 2: Buy food certified as “Non-GMO Project Verified.” The non-profit organization Non-GMO Project operates a detailed, voluntary certification process so that food producers can test and verify that, to the best of their knowledge, they have avoided using genetically modified ingredients in their products. The Non-GMO Project is the only organization offering independent verification for GMO products in the U.S. and Canada (Non-GMO Project 2014). 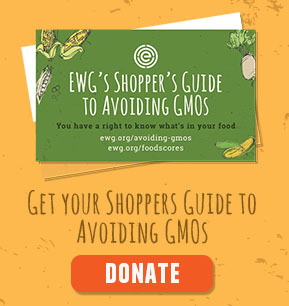 Option 3: Use EWG’s Shopper’s Guide to Avoiding GMOs and EWG's Food Scores Database to find foods made without ingredients likely to be genetically modified. Eating only organic and certified GMO-free food is not an option for some people. EWG’s Shopper’s Guide to Avoiding GMOs helps consumers find products made without ingredients that are likely to be genetically modified. As well, it aims to help shoppers decide which products are the most important to buy organic or certified GMO-free. Avoiding genetically modified ingredients isn’t easy. In fact, some estimates indicate that more than 75 percent of the food in supermarkets is genetically modified or contains genetically modified ingredients (Center for Food Safety 2013b). Consumers need to know what to look for to make informed purchasing decisions. The U.S. is the world’s largest corn producer. According to the U.S. Department of Agriculture, last year, American farmers planted more corn than any other crop, covering 95 million acres. (USDA 2013a). Some 90 percent of corn grown in the U.S. is genetically modified (USDA 2013b). Most of the crop is field corn cultivated for animal feed, but about 12 percent is processed to corn flour, high fructose corn syrup, corn starch, masa, corn meal and corn oil that end up in foods consumed by people (EPA 2013). Consumers should assume that those ingredients in processed food are genetically modified. Less than one percent of the American corn crop is sweet corn, also known as table corn (Iowa State University 2011). Soybeans are the second most planted American crop, covering more than 76 million acres last year (USDA 2013a). Some 93 percent of soybeans grown in this country have been genetically modified (USDA 2013b). Soybean-based products and soybean-derived ingredients are common on supermarket shelves. Consumers should assume that products whose labels disclose the presence of soy proteins, soybean oil, soy milk, soy flour, soy sauce, tofu or soy lecithin have been made with genetically modified ingredients unless they are certified organic or GMO-free. About 55 percent of the sugar produced in the U.S. comes from sugar beets, 95 percent of which have been genetically modified (USDA 2013c). If a product label does not specify that it has been made with “pure cane” sugar, chances are significant that it contains genetically modified beet sugar. Consumers should assume that vegetable oil, canola oil, cottonseed oil, soybean oil and corn oil are genetically modified. About 90 percent of American oilseed production is soybeans, which are almost entirely genetically modified (USDA 2013b). The remaining 10 percent of oilseed crops are cottonseed, sunflower seed, canola, rapeseed, and peanut. Canola and cottonseed oil primarily come from genetically modified varieties. More than 90 percent of corn oil is derived from genetically modified corn. Papaya: According to the Hawaiian Papaya Industry Association, more than 75 percent of Hawaiian papaya is genetically modified to resist the ringspot virus (Hawaiian Papaya Industry Association 2013). Zucchini and yellow summer squash: A few varieties of squash are genetically modified. Without adequate labeling, concerned consumers can’t spot genetically modified varieties. If you want to be sure, opt for organic varieties. Sweet corn: Most sweet corn sold in supermarkets and farm stands is not grown from genetically modified seeds, but a few varieties are, so it’s best to buy organic sweet corn. Many other genetically modified foods could be coming soon to a grocery store near you. These have either been approved by the federal Food and Drug Administration or are being considered for approval. Among them: salmon, flax, plums, potato, radicchio, rice, tomato and wheat (FDA 2014). The FDA is considering a producer’s application for genetically modified AquAdvantage salmon. Normal salmon produce growth hormones only in summer months. These fish produce them year round and grow at twice the normal rate. If the FDA approves AquAdvantage salmon, it will be the first genetically modified animal available in American supermarkets. The FDA faces two other controversial decisions: whether to approve apples genetically modified to not to turn brown when sliced, peeled or bruised and new varieties of corn and soybean genetically modified to resist the toxic herbicide 2,4-D (USDA 2013e, 2013f). Benbrook, C. (2009) Impacts of genetically engineered crops on pesticide use in the U.S.: the first thirteen years. Available: http://www.organic-center.org/reportfiles/GE13YearsReport.pdf Accessed January 6, 2014. Center for Food Safety (2013a) International Labeling Laws. Available: http://www.centerforfoodsafety.org/issues/976/ge-food-labeling/international-labeling-laws# Accessed January 7, 2014. Center for Food Safety (2013b) About Genetically Engineered Foods. Available: http://www.centerforfoodsafety.org/issues/311/ge-foods/about-ge-foods Accessed January 7, 2014. Environmental Protection Agency (2013) Major Crops Grown in the United States. Available: http://www.epa.gov/oecaagct/ag101/cropmajor.html Accessed December 3, 2013. Farm Industry News (2013) Glyphosate-resistant weed problem extends to more species, more farms. Available: http://farmindustrynews.com/herbicides/glyphosate-resistant-weed-problem-extends-more-species-more-farms Accessed December 8, 2013. Food and Drug Administration (2014). Completed Consultations on Bioengineered Foods. Available: http://www.accessdata.fda.gov/scripts/fcn/fcnNavigation.cfm?rpt=bioListing&displayAll=false&page=1 Accessed January 9, 2014. Hawaiian Papaya Industry Association (2013) Hawaii Grown Papayas: The Rainbow Papaya Story. Available: http://www.hawaiipapaya.com/rainbow.html Accessed November 25, 2013.
International Service for the Acquisition of Agri-biotech Applications (ISAAA) (2009) Global Status of Commercialized Biotech/GM Crops: 2009 – The First Fourteen Years, 1996 to 2009. Available: http://www.isaaa.org/resources/publications/briefs/41/executivesummary/default.asp Accessed January 7, 2014.
International Service for the Acquisition of Agri-biotech Applications (ISAAA) (2012) Global Status of Commercialized Biotech/GM Crops: 2012. Available: http://www.isaaa.org/resources/publications/briefs/44/executivesummary/default.asp Accessed January 7, 2014. Iowa State University (2011) Corn Production: Common Corn Questions and Answers. Available: http://www.agronext.iastate.edu/corn/corn-qna.html Accessed January 7, 2014. Non-GMO Project (2014) The “Non-GMO Project Verified” Seal. Available: http://www.nongmoproject.org/learn-more/understanding-our-seal/ Accessed January 7, 2014. Union of Concerned Scientists (2001) Union of Concerned Scientists Comments to the Environmental Protection Agency on the renewal of BT-Crop Registration. Docket OPP-00678B. Available: http://web.peacelink.it/tematiche/ecologia/bt_renewal_ucs.pdf Accessed January 6, 2014. Union of Concerned Scientists (2009) Genetic Engineering has Failed to Significantly Boost U.S. Crop Yields Despite Biotech Industry Claims. Available: http://www.ucsusa.org/news/press_release/ge-fails-to-increase-yields-0219.html Accessed January 7, 2014. U.S. Department of Agriculture (2013a) National Statistics by Subject. Available: http://www.nass.usda.gov/Statistics_by_Subject/index.php Accessed December 3, 2013. U.S. Department of Agriculture (2013b) Adoption of genetically engineered crops in the U.S. Available: http://www.ers.usda.gov/data-products/adoption-of-genetically-engineered-crops-in-the-us.aspx#.Up5PL40h0jU Accessed December 3, 2013. U.S. Department of Agriculture (2013d) Organic 101: Can GMOs be used in organic products. Available: http://blogs.usda.gov/2013/05/17/organic-101-can-gmos-be-used-in-organic-products/ Accessed December 8, 2013. U.S. Department of Agriculture (2013e) Dow AgroSciences Petitions (09-233-01p, 09-349-01p, and 11-234-01p) for Determinations of Nonregulated Status for 2,4-D-Resistant Corn and Soybean Varieties. Draft Environmental Impact Statement—2013. Available: http://www.aphis.usda.gov/brs/aphisdocs/24d_deis.pdf Accessed January 9, 2014. U.S. Department of Agriculture (2013ef) Okanagan Specialty Fruits, Inc.; Availability of Plant Pest Risk Assessment and Environmental Assessment for Determination of Nonregulated Status of Apples Genetically Engineered To Resist Browning. [Docket No. APHIS–2012–0025] Federal Register 78:251 (December 31, 2013) p 79658. Available: http://www.aphis.usda.gov/brs/fedregister/USDA_20131104.pdf Accessed January 9, 2014.